About 100 people were killed Saturday in a car bomb explosion targeting pro-regime evacuees leaving besieged Syrian towns, a volunteer rescue agency said. 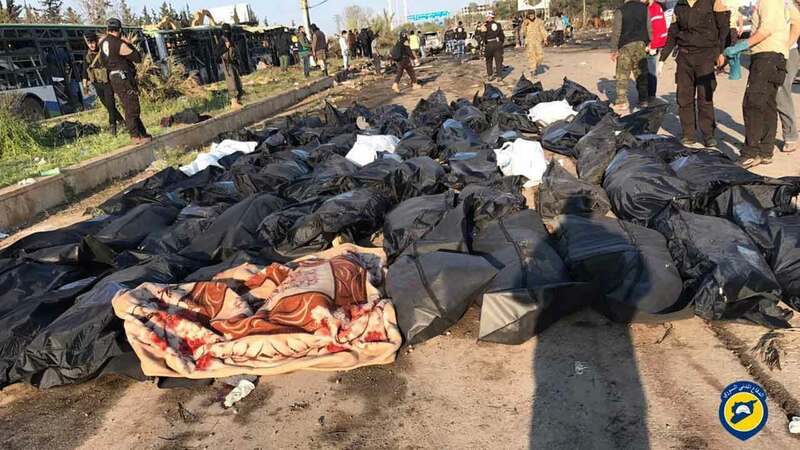 The convoy of buses, which were parked at the time, was carrying thousands of people from two regime-held but rebel-besieged villages in northwestern Syria, state-run media reported. People were evacuating two rebel-held towns in southwest Syria at the same time under a so-called Four Towns Agreement. The evacuees, from the mainly pro-regime Shia villages of Al-Fu'ah and Kafriya, were bound for regime-held parts of Aleppo. Abdul Rahman said he doesn't believe the Syrian regime is behind the attack. He said the regime kills scores of people daily using all types of weaponry and doesn't need to kill its own sympathizers. The rebel group Ahrar al-Sham tweeted that some of its members died in the blast. They were at the site to ensure the convoy's passage, Ahrar al-Sham said. The group said it was investigating to find out who was responsible. The explosives-rigged car had been packed with children's food supplies, perhaps to disguise it, a correspondent with SANA reported. The convoy that departed Al-Fu'ah and Kafriya is carrying 5,000 people, the Syrian Observatory for Human Rights said. "We call on the parties to ensure the safety and security of those waiting to be evacuated. Those responsible for today's attack must be brought to justice." The Syrian American Medical Society said in a statement: "This forced displacement is a clear violation of international humanitarian law, and marks yet another sad chapter in the history of this crisis. The absence of the UN and international community from this process has left the civilian populations especially vulnerable, leading to horrific events such as what took place today. "The UN must not abandon its role in protecting innocent civilians and enforcing international humanitarian laws."